. . . Gere has been meeting with a variety of organizations working toward Palestinian-Israeli coexistence and reconciliation. In the past, he tended to focus on the positive and hold back when it came to criticizing the Israeli government’s policies. Not this time.
. .. . [H]e said he was “taken” with two groups he visited on the day of the premiere: Women Wage Peace, which rallies Israeli and Palestinian women together in political action; and YaLa, which trains youth for leadership, harnessing social media to learn communication, peacemaking and leadership skills and promoting ongoing dialogue. Gere also met with representatives of the nongovernmental organization Breaking the Silence in New York before his trip, and said he planned to meet with them in Israel as well. The demonization of the group by Prime Minister Benjamin Netanyahu and others on the right appalled him, he said, as have the condemnations of J Street by the Trump administration’s new ambassador to Israel, David Friedman. “It is all so counter to what I know of Jewish culture,” Gere says. “Questioning authority makes you a kapo? To question authority makes you a traitor? If you question bad policies you are a self-hating Jew? That is insane. And, of course it’s the last resort of tyrants.” . . .
“Norman” explores the intersection of two worlds: New York Jews and Israeli politics. In the film, future Israeli Prime Minister Eshel (played by Lior Ashkenazi), . . . is befriended by struggling, opportunistic “fixer” Norman Oppenheimer (Gere). . . .
. . . Gere’s character bears similarities to Morris Talansky, who was the key witness in the corruption case that landed former Prime Minister Ehud Olmert in prison. 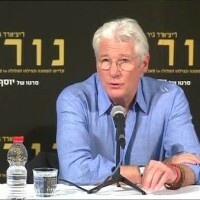 Both Cedar and Gere stress that while the film was clearly influenced by the tale of Olmert and Talansky (to whom Cedar is related), Norman is very much his own character. The character of Eshel is also distinct from the disgraced ex-premier Olmert, whose downfall Gere views with sadness. While he can’t pass judgment on Olmert’s corruption case because “I don’t know anything about what the problems were, I don’t know the details of it,” Gere says he wonders . . . whether the value of the peace deal that Olmert might have been able to make would have outweighed the immorality of the corruption that brought him down.